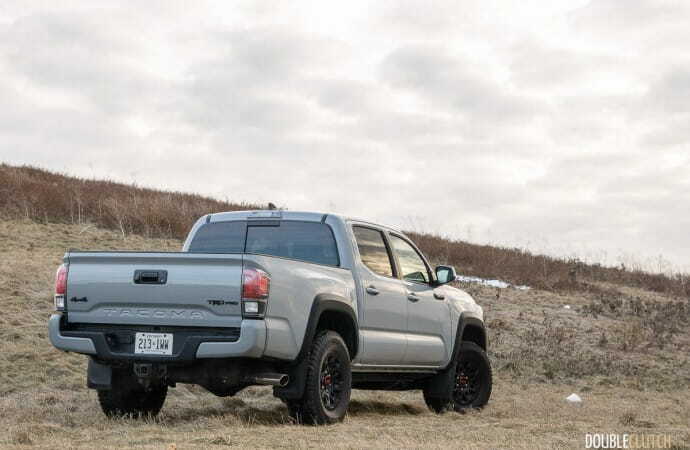 Many off-road enthusiasts like to procure a solid used truck as a base to build on, and add on parts designed by the aftermarket. Off-roading is an extremely popular hobby nowadays, with a hearty community, and brand loyalty that really is second to none. 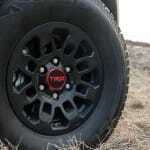 People often outfit their off-road rigs with lifted springs, different dampers, and beefy tires. The Jeep Wrangler (reviewed here) is synonymous with serious off-road shenanigans, but there are a few other important players out there. 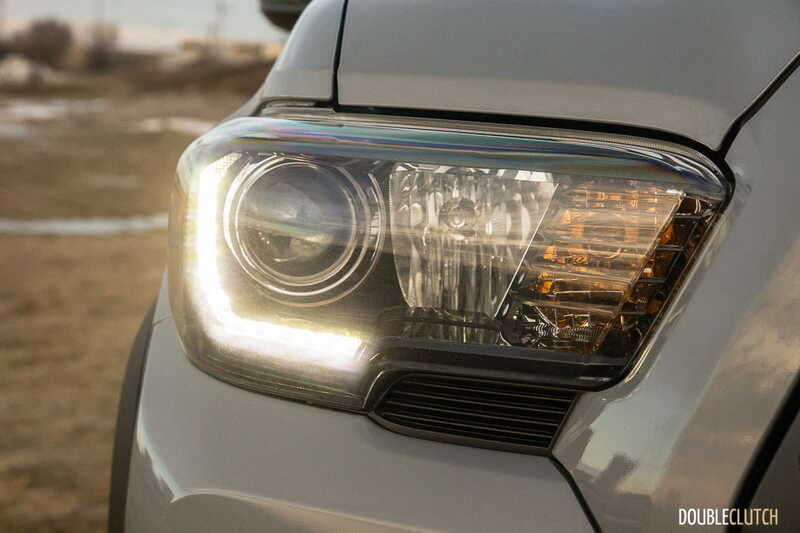 Vehicles like the Toyota Land Cruiser and Nissan Armada (reviewed here) are appealing because of their built-in capability with the dune-smashing durability that really isn’t matched by anybody else. 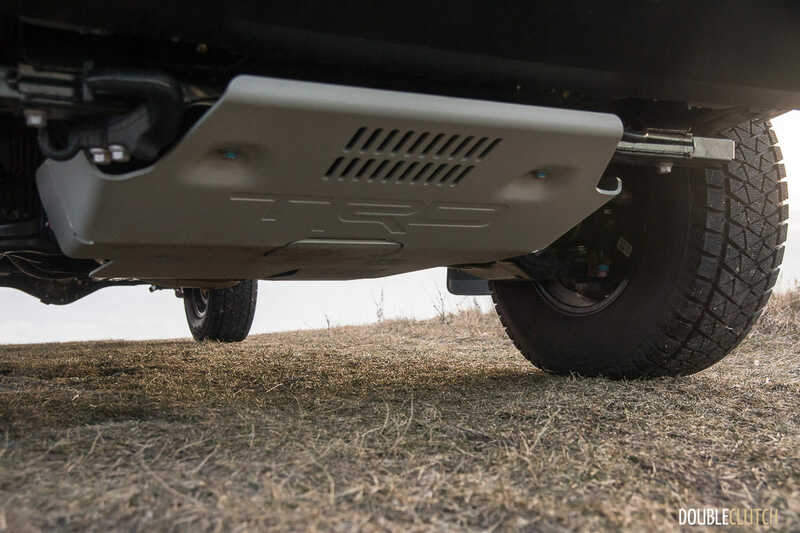 Equipped with low-range transfer cases and locking differentials (at least the Land Cruiser does), it is pretty much unbeatable – unless you find a spot where the truck won’t actually fit. 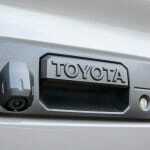 Toyota doesn’t technically sell the Land Cruiser in Canada, but they are said to be available if you ask nicely enough. 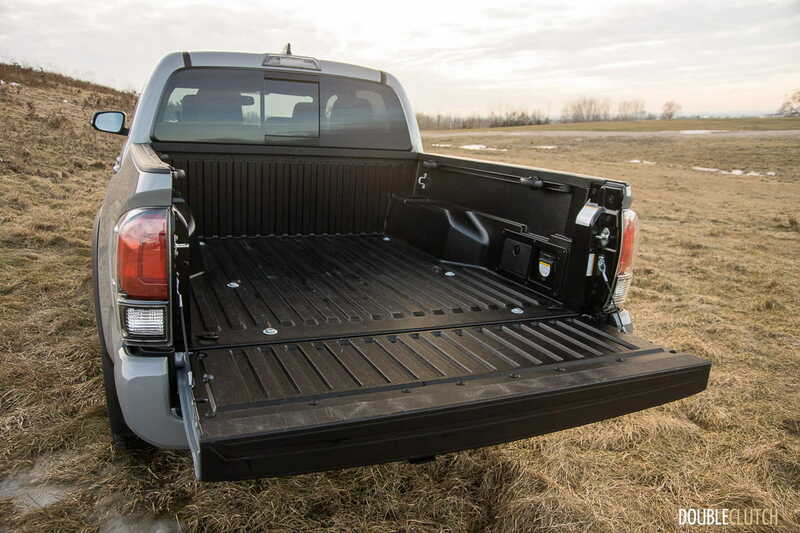 As far as “real” trucks go (ones with a full ladder frame, not a unibody), there’s the Tundra full-size pick-up truck, Sequoia full-size SUV, 4Runner mid-size SUV, and the Tacoma (reviewed here). Working the daily grind is something trucks are good at, but weekend use is also important, with many taking advantage of the generous ground clearance and rugged frames to hit the dirt. 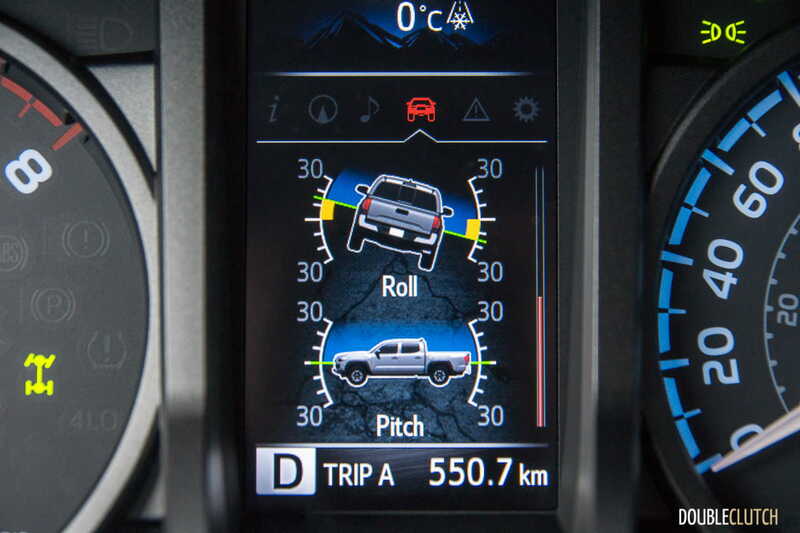 Ford’s Raptor has won critical acclaim just about everywhere for its off-road focus – the result is some impressive capabilities and a ton of fun. 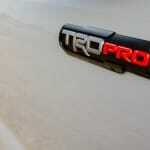 Toyota has also joined the game with their TRD Pro lineup, and it spans across most of their full-frame lineup. The smallest of the family to get the upgrades is the Tacoma. 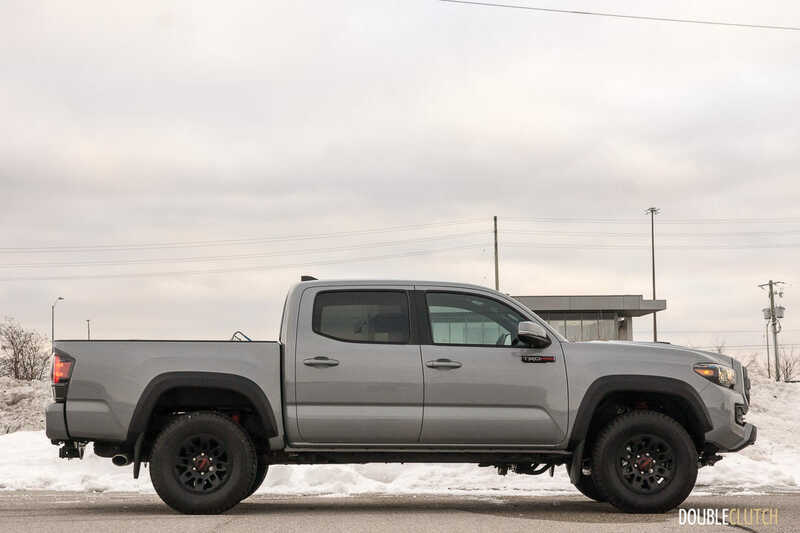 We picked up a 2017 Toyota Tacoma TRD Pro 4×4, equipped with a five-foot bed and four full doors. Real trucks really do all look the same. There’s the engine up front, cabin in the middle for passengers, and the bed behind to carry the payload. So what sets this one apart from the rest? 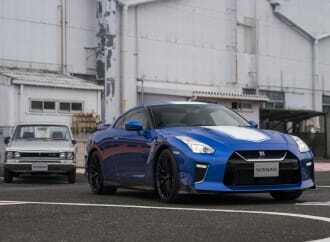 First up, the Cement Grey colour really grabs your attention, with its almost primer-like appearance. It reminds me a bit of Audi’s Nardo Grey. Upon closer inspection, there’s actually a fair bit of metallic flake in it, which reflects minute amounts of secondary colours under the right light. 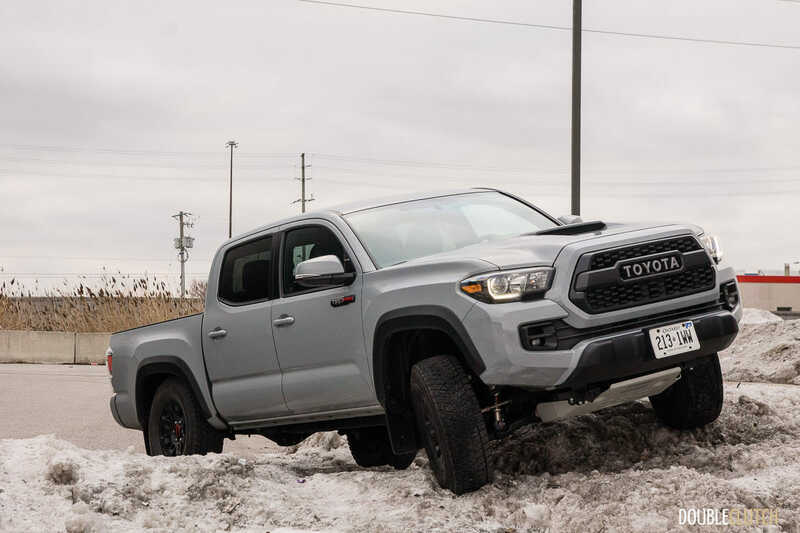 Put simply: while you can also get the Tacoma TRD Pro in Alpine White and Barcelona Red Metallic, the best colour here by a long shot is Cement Grey Metallic. 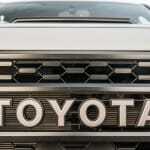 The next design feature that caught my attention had to be the old-school TOYOTA logo, spelled out in the front grille. 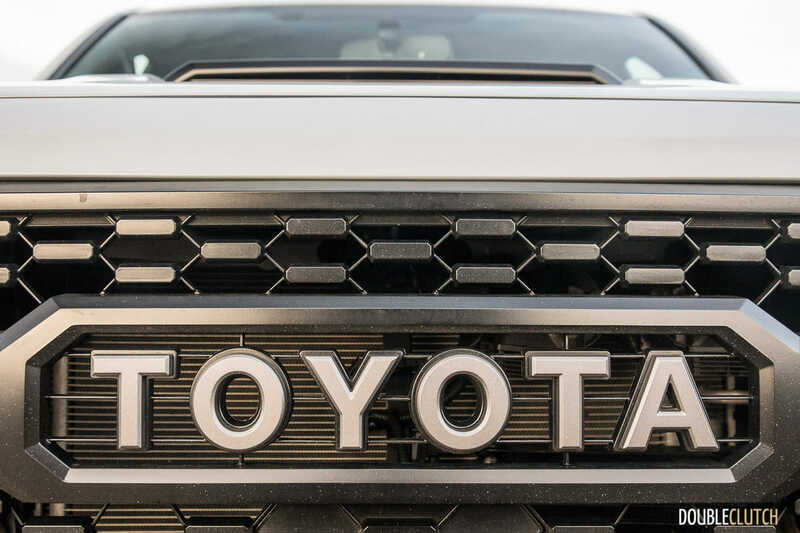 The current Toyota emblem that we are all familiar with today dates back to late 1989, so for the TRD Pro products to get the heritage branding, is awesome to see. 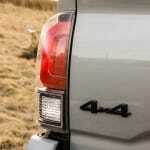 The standard Tacoma makes do with the current corporate emblem, which seems just a little pedestrian, by comparison. 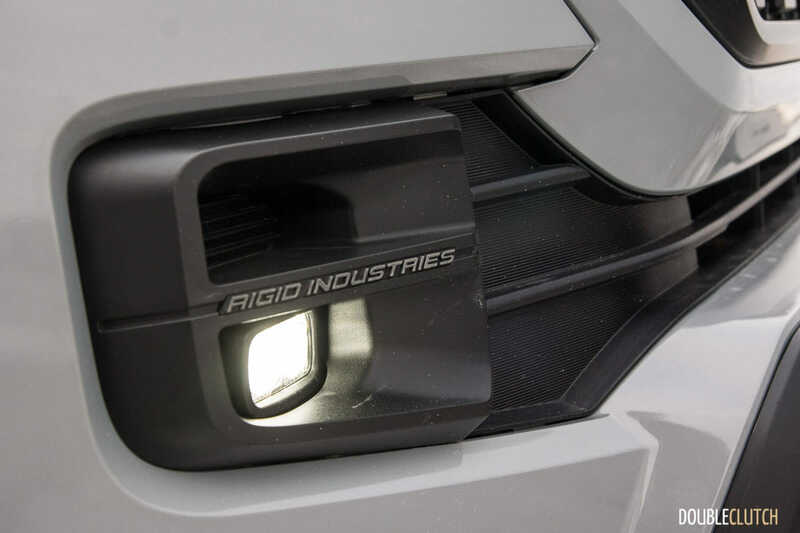 The front-end of the gets a set of super-bright LED fog lights, supplied by off-road lighting specialist Rigid Industries. 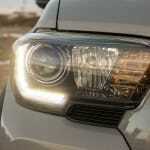 Since the TRD Pro is equipped with conventional halogen projector low-beam headlights (no HID or LED headlight upgrades here), having these bright LED fog lights is handy. The Tacoma TRD Pro also features a simulated hood scoop, but if you open the hood, you’ll notice the scoop doesn’t really go anywhere. In this case, it’s purely for aesthetics. 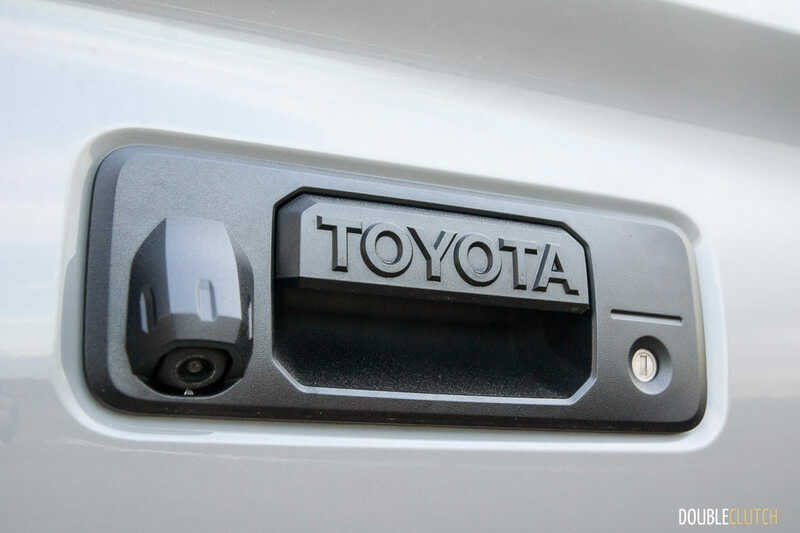 The TRD-branded skid plate mounted underneath the front bumper cover, however, is a very functional item, as it protects vital hardware, like the oil pan, transfer case, and cooling bits. 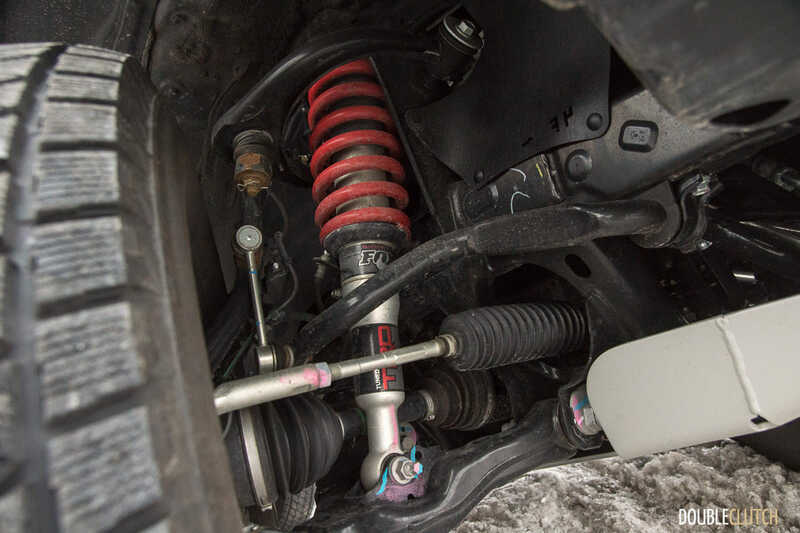 Dampers from Fox, an off-road suspension specialist, are fitted instead of the Bilstein dampers seen on standard Tacomas. They’re built to not only handle more abuse off-road, but provide a supple ride on-road, through better shock valving. 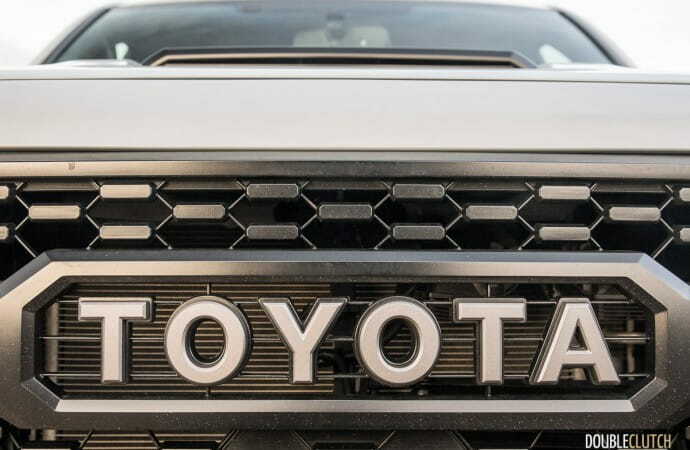 While it’s not meant to complete the Dakar rally out of the box, the upgraded goodies from Toyota give it serious credentials for casual and even fairly serious off-roaders. 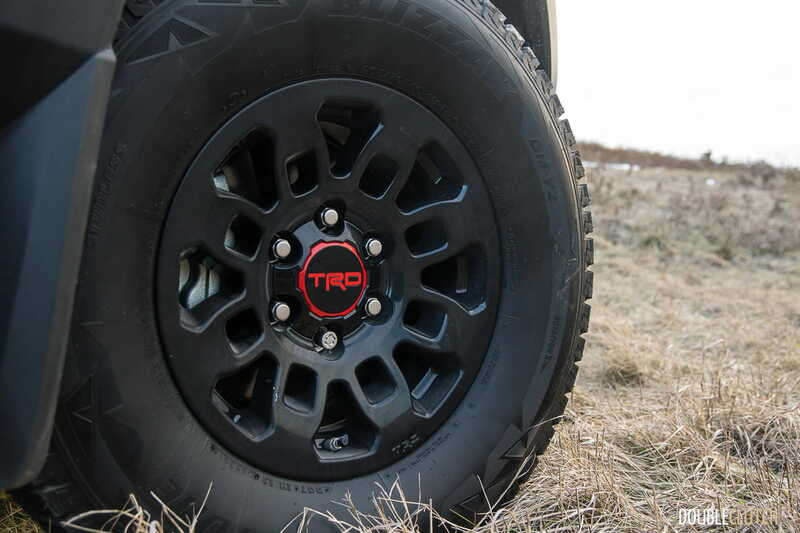 The Tacoma TRD Pro rides on meaty 265-section tires on 16-inch wheels, though the rear wheels hide drum brakes. This is not a bad thing, from a durability point of view. Inside, the cabin is a no-nonsense affair. 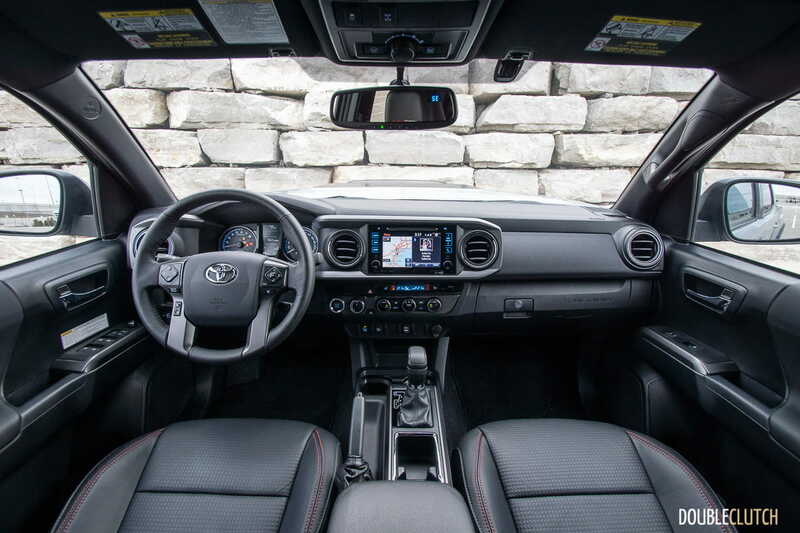 The corporate Toyota infotainment lives up front and centre. 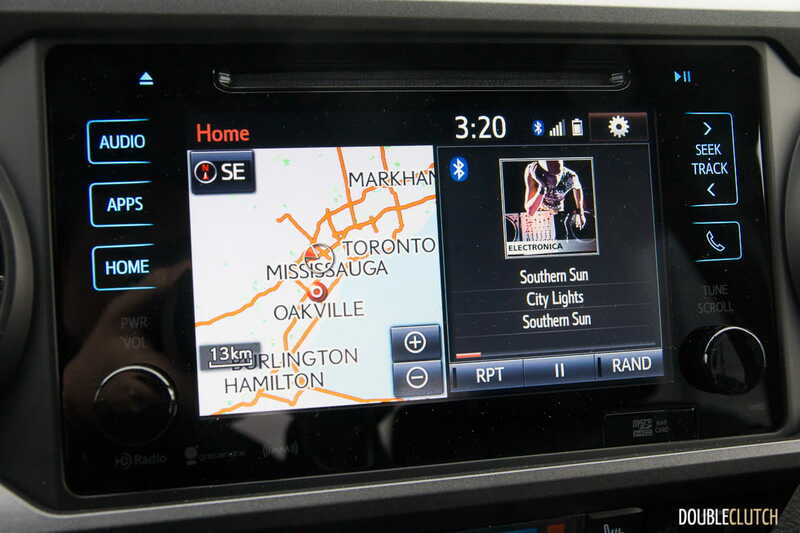 It’s a familiar interface that works well, but is lacking the most current connectivity options, namely Android Auto and Apple Carplay. 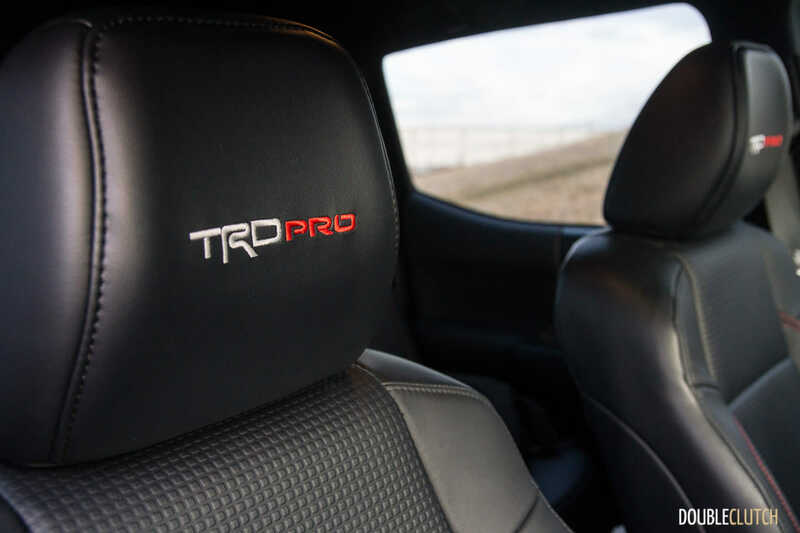 Simulated leather seats (with heat) are the name of the game here, and the TRD Pro package gets some additional embroidery on the headrest. 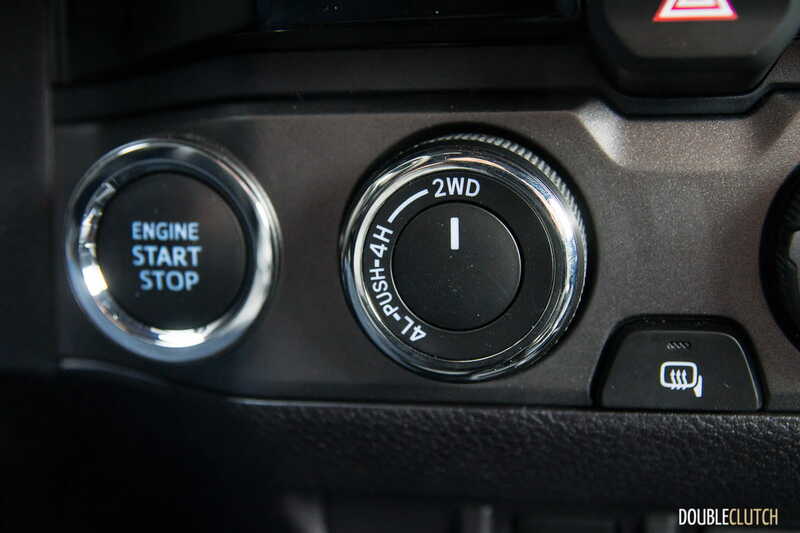 The presence of a proper hand-operated parking brake is welcome, and the gear selector knob gets some additional TRD badging. From the driver’s seat, if you look up and to the right, you might notice the Easter egg that is the built-in official GoPro mount stuck to the inside of the windshield. 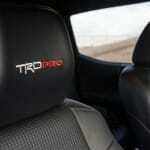 One thing worth noting: the seat bottoms aren’t height adjustable, and the cushions themselves are quite short. 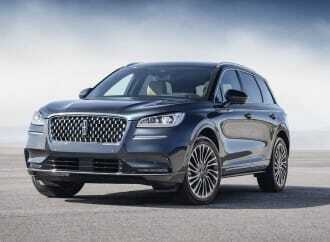 Under the hood lives your choice of two engines: a 2.7L inline four-cylinder, and an updated 3.5L V6. 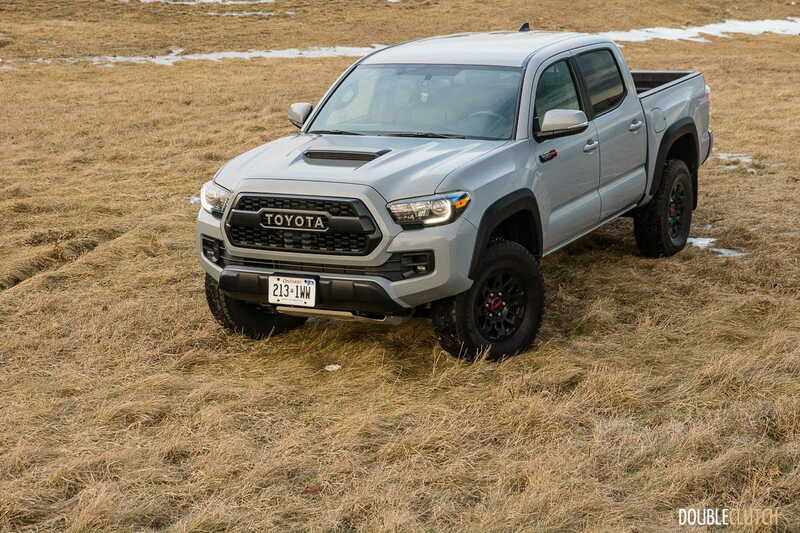 Tacoma fans may notice that this newer V6 is actually smaller than the outgoing 4.0L V6 in the previous-generation truck. 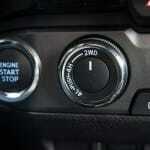 This new engine, however, uses a lot of new technology to make up for the missing displacement. 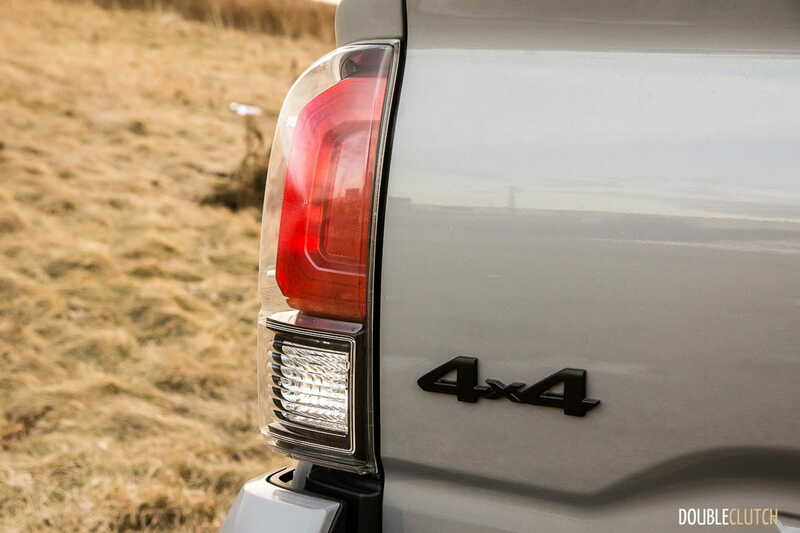 First, the engine (called the 2GR-FKS) gains Toyota’s excellent D4S port-and-direct injection system, both of which are used depending on the workload requested by the driver. Next is the V6’s ability to toggle between the usual Otto combustion cycle, and a simulated Atkinson high-efficiency combustion cycle, on demand. 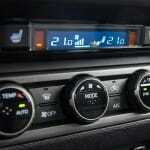 It’s a relatively high-tech V6, also finding a home in the Lexus RX 350 (reviewed here), as well as the Toyota Sienna. 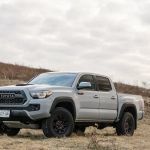 The Tacoma still utilizes traditional hydraulic power steering as well as a hydraulic cooling fan – both items I haven’t seen together in quite some time. 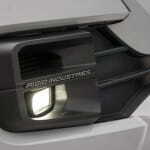 Power is rated at 278 at 6,000RPM, and 265 lb-ft of torque at 4600RPM. 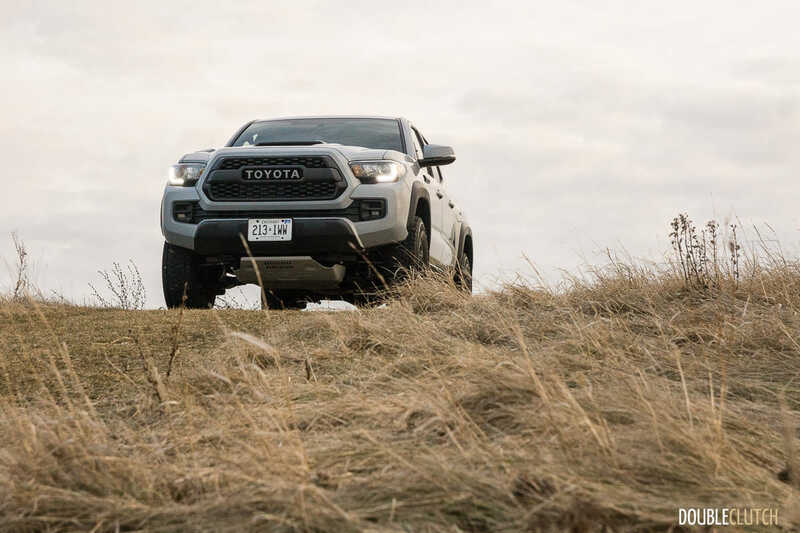 Toyota still gives you the choice of either a six-speed automatic, or a six-speed manual (five-speed with the 4-cylinder) for those who prefer it. 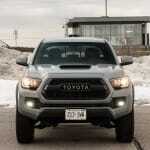 Refinement is good, though the TRD stainless steel exhaust is tuned to let a bit of the tough and gruff sounds into the cabin under load. 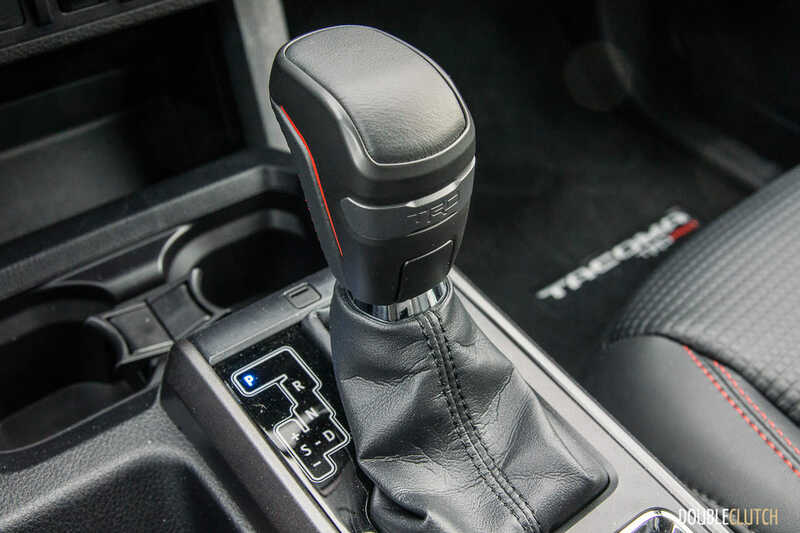 Though the automatic transmission gets the benefit of an additional ratio, its overall gearing is so tall, you’ll find yourself requesting a downshift of one, and often two gears to complete a passing move at speed. 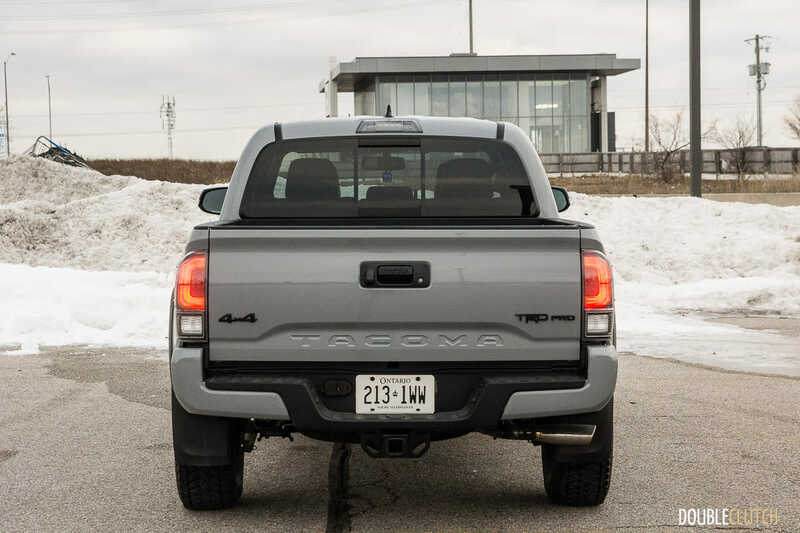 By default, the Tacoma will aim to upshift early and often, which helps efficiency, but it doesn’t really lend itself to a lively dynamic, as far as straight-line acceleration goes. 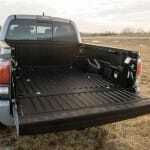 This power is sent to the ground by way of a dedicated selectable 4WD transfer case, with a proper low range ratio. 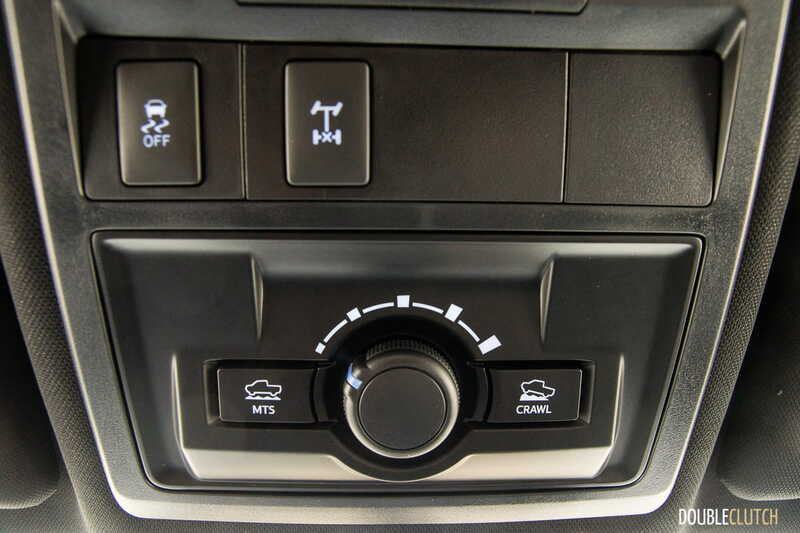 To bolster those off-road credentials, the rear differential can be locked (the controls for this are above your head), for those times where you need maximum traction. 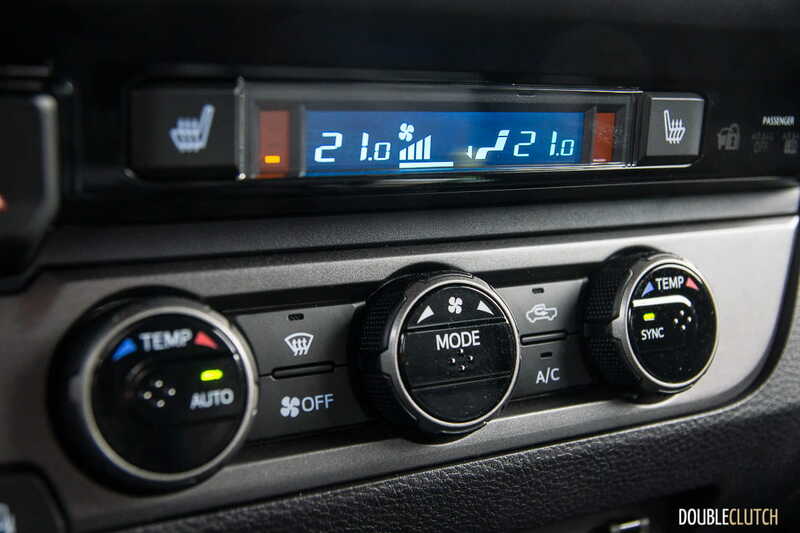 On the electronic side, you also get several different terrain programs, as well as crawl control (also known as hill descent control, automatic transmission only). It may be enough to some knowing that they have all this capable hardware at a moment’s notice, but real-world testing is what we’re after. We found a very tall mound of packed dirt, left to grass over from some long-term construction and infrastructure projects nearby. Starting at the bottom, we engaged 4H, and started to ascend. 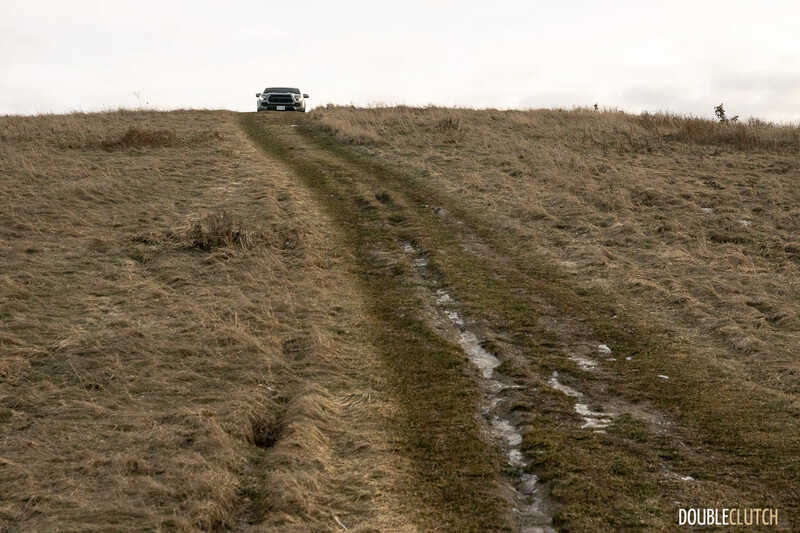 Quickly realizing how steep the hill actually was, we had to stop to engage the low-range gear (4L). At the top, the next step would be to get back down. With 4L engaged, we pressed the “CRAWL” button on the ceiling console, and started to inch forward. 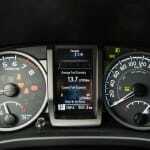 The groans and clicks of the ABS system were very audible as the truck’s electronics kept forward momentum under control. Turning the ceiling-mounted dial was how you control downhill speed, with your feet off both pedals. All you need to do as a driver is control the steering wheel. 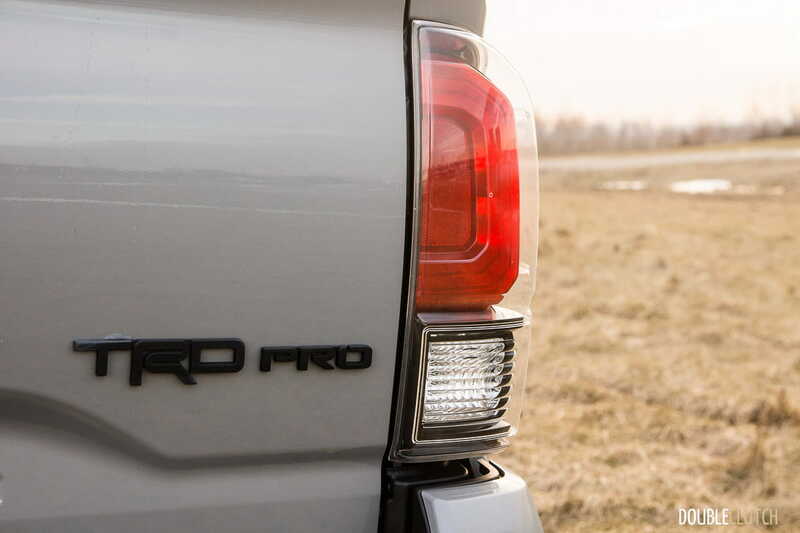 Pickup trucks have never been designed with fuel efficiency in mind, and the Tacoma TRD Pro is no exception. 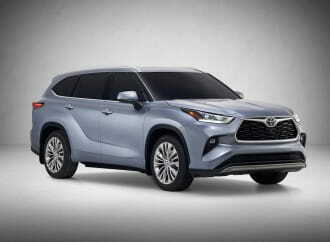 It’s powered by a do-it-all general-purpose V6, though Toyota’s latest efforts improve the expected consumption numbers compared to the old 4.0L V6. 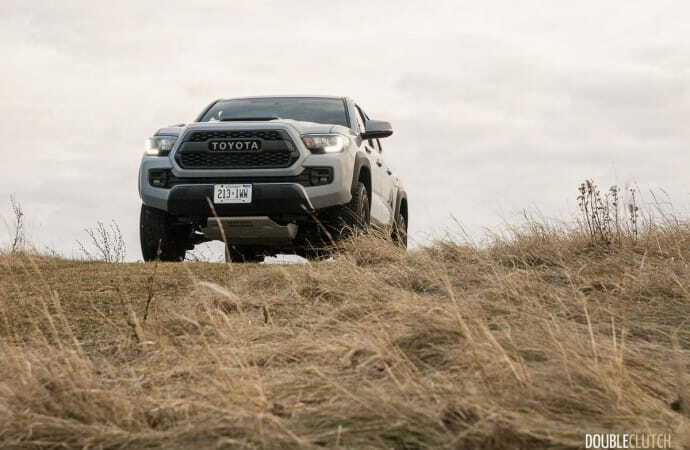 In the city, the Tacoma TRD Pro with the six-speed automatic is rated at 13.2L/100km. 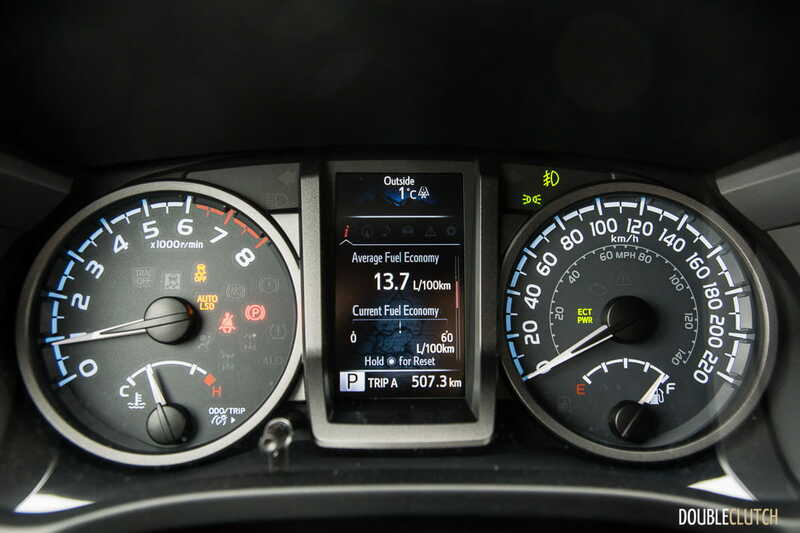 On the highway, it is rated at 10.7L/100km, and in a combined cycle, the expected number is 12.0L/100km. Throughout my week of wintry mixed driving, We saw with an indicated average of 13.5L/100km. All those downshifts needed to access the engine’s powerband didn’t help my results. 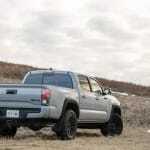 The Tacoma will hold 80L of regular 87-octane fuel, and towing capacity is rated 6,000lbs. 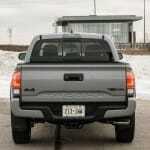 The Toyota Tacoma starts at $29,660, for the four-cylinder, rear-drive model, and the shorter Access Cab. 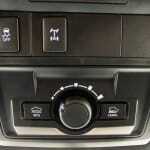 You still get a six-speed automatic transmission, and that all-important GoPro mount in the windshield. 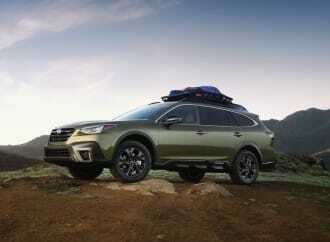 Stepping up to the V6 sees the price jump to at least $37,265, and 4WD become standard. 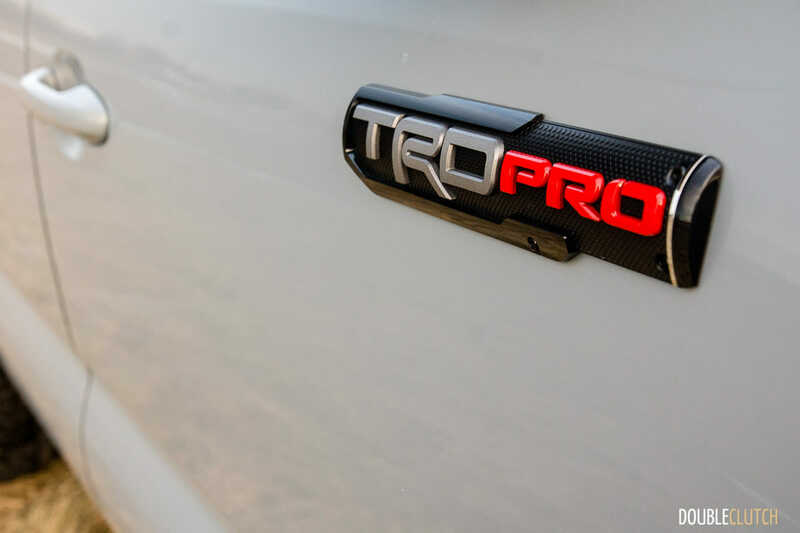 There are various TRD packages on the way as you go up the pricing ladder, but it’s important to know the full-fledged TRD Pro package sits at the top of the heap, and the only way to get it is to opt for a V6 Double Cab. 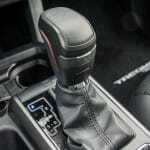 This trim level, on its own starts at $39,390 for a manual transmission model, $40,545 for the automatic. 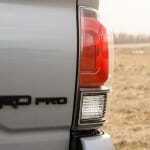 The TRD Pro package adds a whopping $12,850, for an as-tested price of $53,395, before taxes and additional fees. 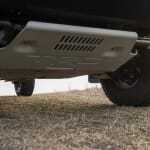 Factory-ready off-road trucks have become very popular lately, thanks to the Ford Raptor. It is marketed as a brawny and masculine do-everything sort of truck, and it does an excellent job portraying an image that people really want to get behind. 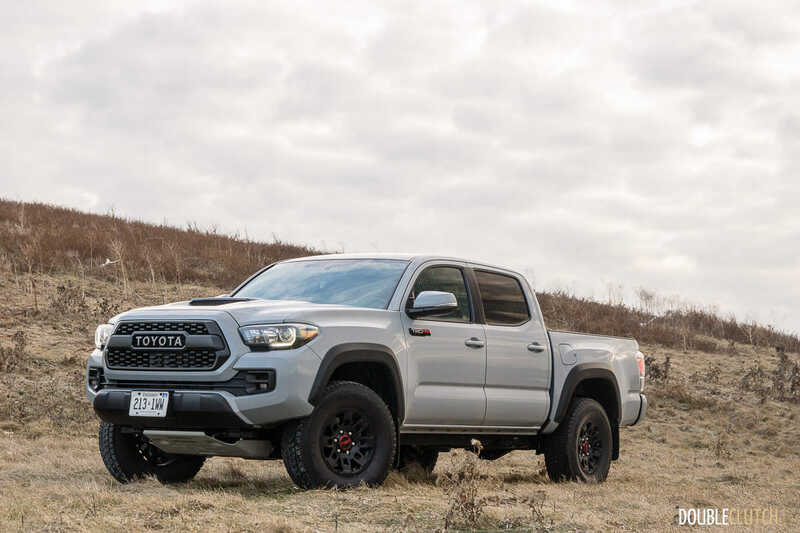 The Toyota Tacoma TRD Pro is aiming at a similar audience, but it’s an audience that doesn’t quite need the size, or the price associated with the Raptor. 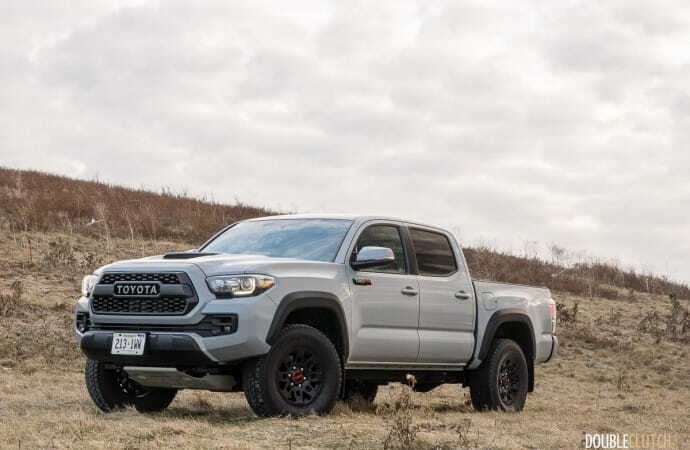 The Tacoma TRD Pro is actually a closer competitor to the upcoming Chevrolet Colorado ZR2. 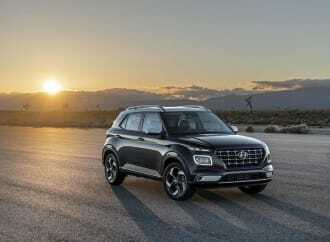 It follows a very similar formula: small truck, legitimate off-road goodies (including some trick Multimatic dampers and a locking front differential), and an optional diesel engine. 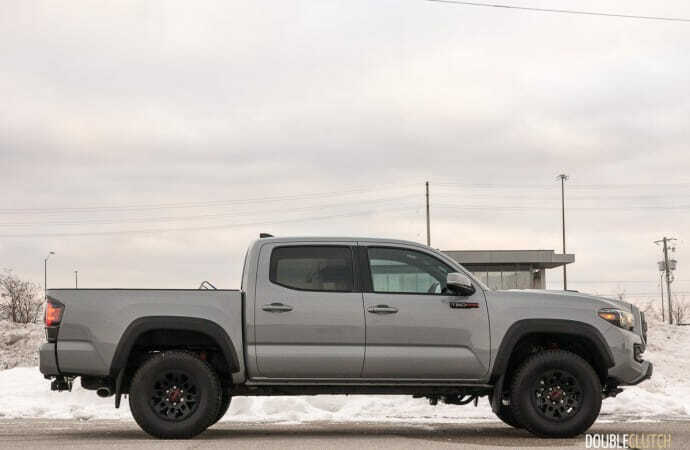 Canadian pricing for the Colorado ZR2 hasn’t been announced yet but we can expect it to be competitive with the Tacoma TRD Pro. 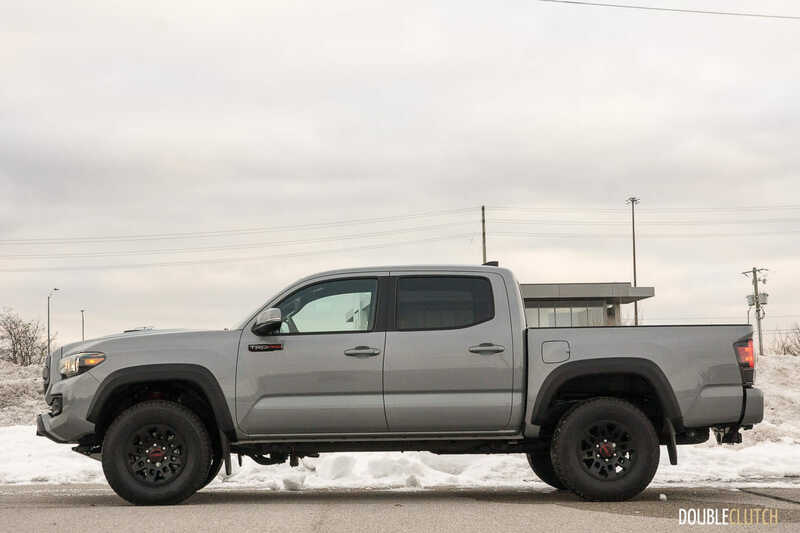 Many off-road enthusiasts like to procure a solid used truck as a base to build on, and add on parts designed by the aftermarket. 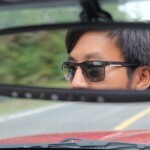 In many of these cases, they are projects where gearheads pour their hearts and souls into. 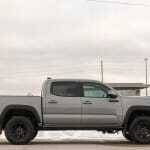 While it is possible to build a decent off-road truck for not a ton of money, the hobby is a deep rabbit hole that can get very expensive, very quickly. 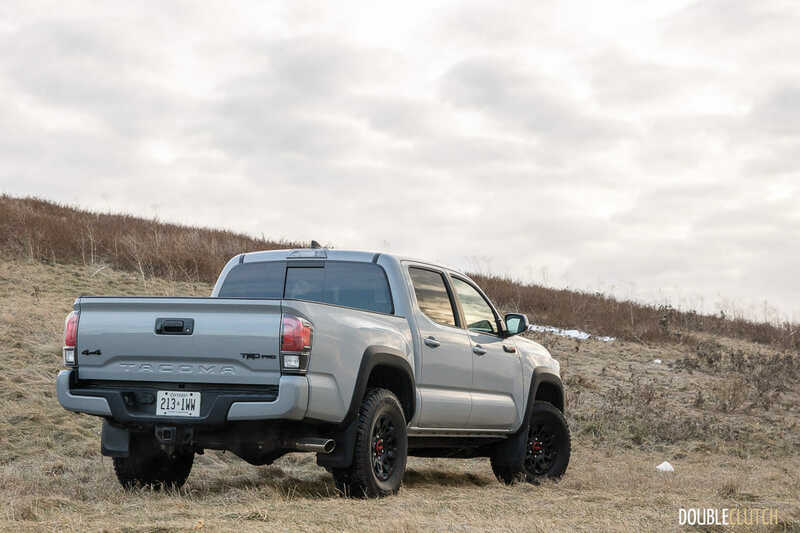 What the Toyota Tacoma TRD Pro does is give enthusiasts a choice if they want something capable, right out of the box, complete with a warranty, unbeatable resale value, and the peace of mind behind all that engineering, qualification, and polish that Toyota is so good at. 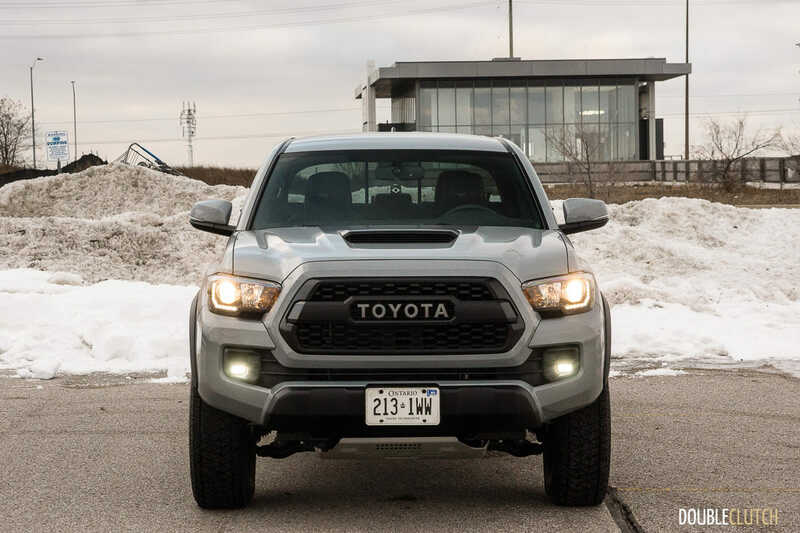 It isn’t without its quirks, but the Tacoma TRD Pro is an exercise in engineering and traditional know-how, rather than being just a pretty face.